IT WAS DEEMED an ugly blot on an otherwise picture-perfect Kerry village. But the Cul Fadda housing estate has been transformed into an outdoor art project ahead of the 2012 Tidy Towns competition, after a German artist and 57 school children banded together transform the empty and uncompleted ghost estate. “People said it was an eyesore because it would prevent Sneem from winning another Tidy Towns award,” Jochen Gersz told TheJournal.ie. 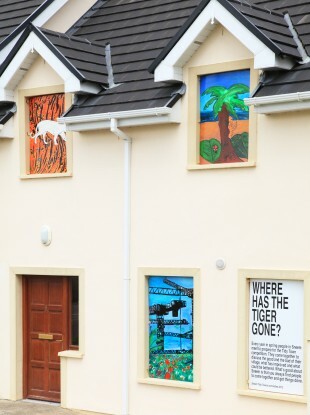 Local children then painted 22 different images, which they placed in windows on the estate. Its joyful, make a sad thing into something people like to see and look at. Email “Ghost estate turned into outdoor art exhibition”. Feedback on “Ghost estate turned into outdoor art exhibition”.